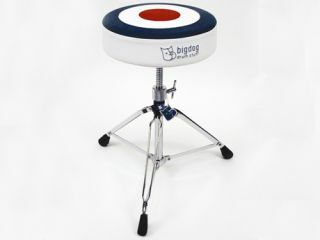 PRESS RELEASE: Bigdog - the innovative UK drum accessory manufacturer - has launched a new range of drum thrones, to be distributed throughout the UK and Ireland by The Music Shipping Co.
Bigdog thrones are available in a variety of durable finishes, embroidered on the edge with the Bigdog logo in high quality stitching. They come in saddle or throne styles, in vinyl or cloth. All models feature heavy duty, double-braced legs, Bigdog wingnuts, high-grip feet and heavy duty seat top clamps. The PRO models feature rock-solid double threaded height adjustments and CNC machined aluminium leg clamps for ultimate strength and reliability. The stool tops feature a lightweight, adjustable casting fitted to the throne for reliable attachment to the base. Also available is a Red/White/Blue Target design. SRP for these is £115.99 each. Bigdog's contoured saddle seats are also available in various finishes including "Retro Stripe" in Red with White Stripe, Black with Tan Stripe, Blue with White Stripe and Tan with Black Stripe. Also available in saddle seats are black suede effect tops with sparkle edges. The SRP is £129.99 each.